It is no secret in my family, or in fact in the state of Wisconsin, that my dad loves Brett Favre come hell or high water. 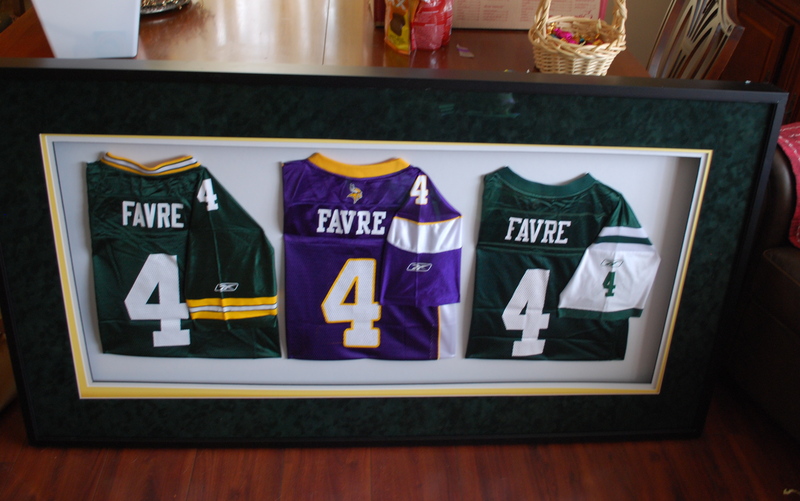 So this year for Christmas, my stepmom hunted down Favre jerseys from each of his NFL teams. She worked with the fine folks over at Michael’s to get them displayed in this gargantuan picture frame. What makes this an especially genius idea is that she saw this being sold somewhere for $1500. Seriously? 1500 DOLLARS? Two of these jerseys can be bought for like, $10 thanks to Favre’s fickle years. And, last time a checked, even a frame of this size does not cost $1400. All this to say it was a crafty way to give a man who has everything something he doesn’t have, and even more importantly, something he can’t buy himself. Previous postAu Revoir, 2010. It’s been real.